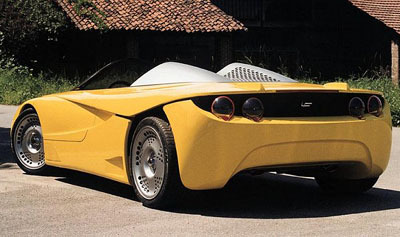 The Fioravanti F100 from 2000 was a concept dedicated to Ferrari celebrating 100 years since the Birth Enzo Ferrari. 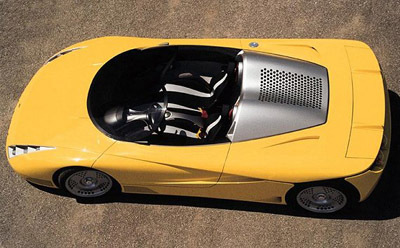 The Fioravanti F100 was designed to accept a V10 engine coupled to a F1 style sequential transmission with steering wheel mounted paddle shift. Part of the aim of the F100's designers was to combat the air turbulence found in high-performance open top sports cars. The result was a multispherical windscreen which guided the oncoming air around the cockpit and smoothly over the rear or the car. 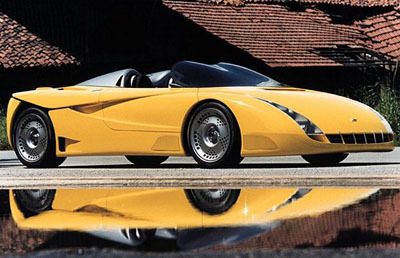 Other features of the Fioravanti F100 included distinctive, if unattractive steel wheels and air brakes to increase drag during braking.